A look down the firing floor of the Steam Plant from the newer south end. Through the doorway at the far end, a glimpse of the older, original part of the heating plant can be seen in the distance. The front of Boilers #7 & #6 respectively are to the left. 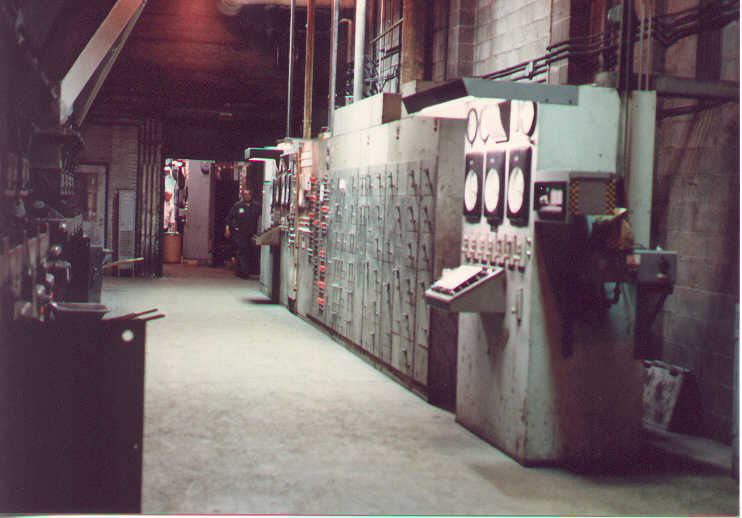 A long row of control equipment and electrical panels associated with these boilers are to the right. The Chilled Water Plant is situated on the other side of the wall to the right. It can be entered through several doorways, one of which is to the right, just beyond the long stretch of control panels. A head-on view of Boiler #7 which is a travelling grate, stoker fired boiler. 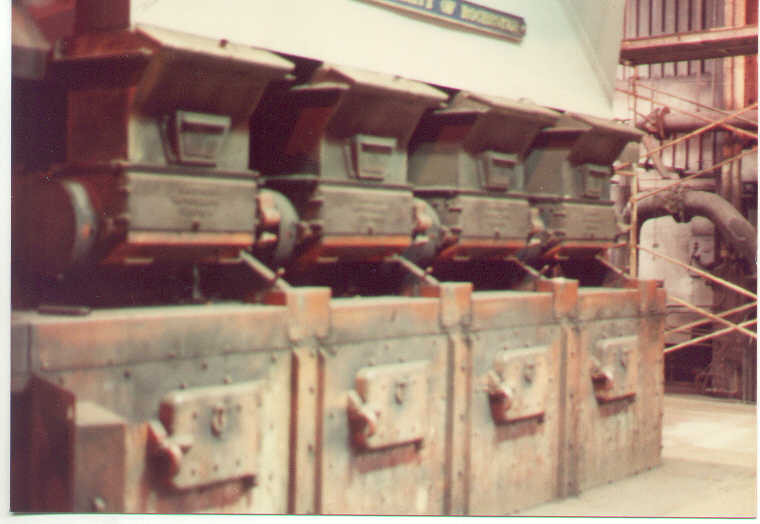 Shown here are the four coal stokers with fire inspection doors below them. Coal would be gravity fed to the stokers through the chute above, taking the coal from the overhead bunkers. The stokers would toss the coal into the furnace at a variable rate, some would burn in suspension, the rest falling to the grate below. The grate slowing moved towards the front of the boiler. The burned up ash would then cascade off the travelling grate into the hoppers below. On an average day, this boiler would consume more then a hundred tons of coal as it produced high pressure steam. 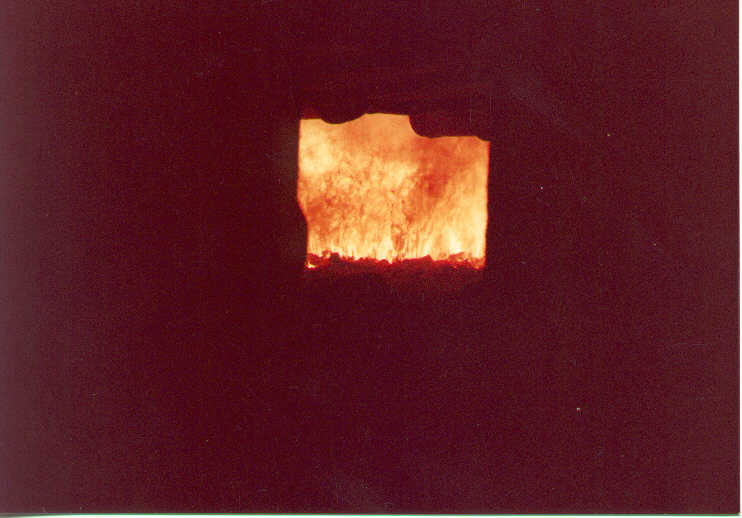 A view through one of the inspection doors shows a burning bed of coal on the grate. 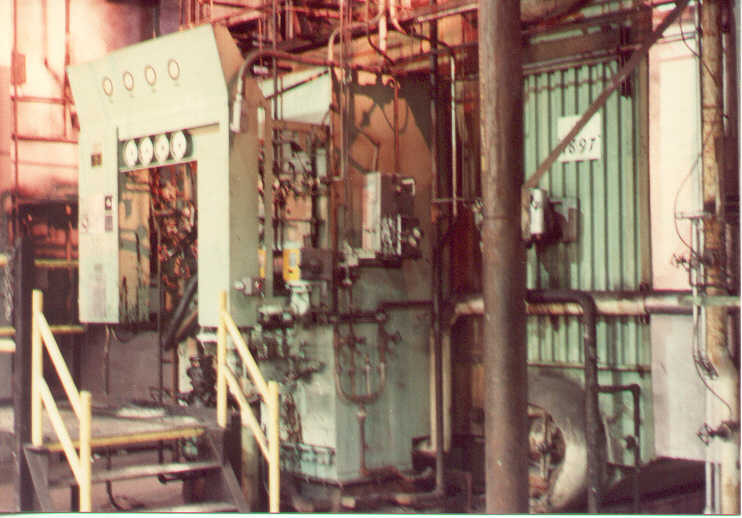 This type of boiler is essentially one large rectangular furnace area surrounded by numerous tubes. On the outside, the tubes are covered with insulation and encased in a metal jacket. On the inside they line the furnace walls and face the fire. 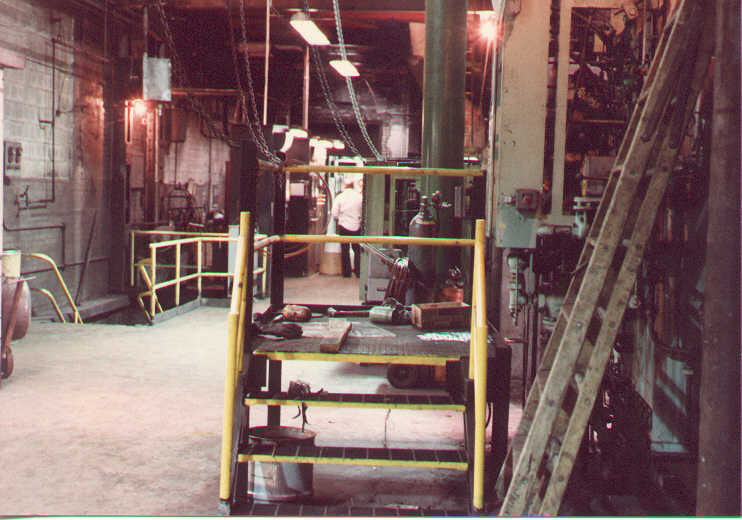 When in operation, all of the boiler tubes are filled with water or a mixture of steam bubbles and water. The intense heat of the fire in the furnace created by burning fuel, causes the water in the tubes to become steam. 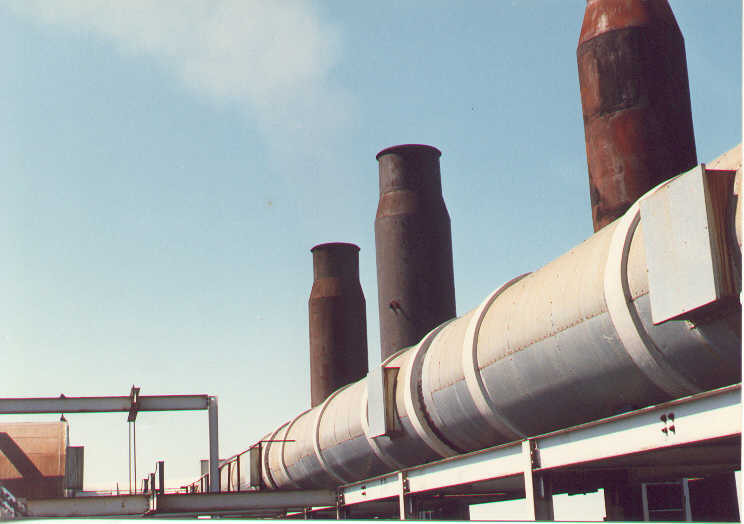 The steam rises through the boiler tubes to a drum at the top, from the drum it is carried away through the plant piping to be utilized for heating or other purposes. A feedwater system exists to keep the boilers constantly supplied with water as the steam is carried away. The bottom ash hoppers for Boiler #7, found in the basement directly below the boiler. 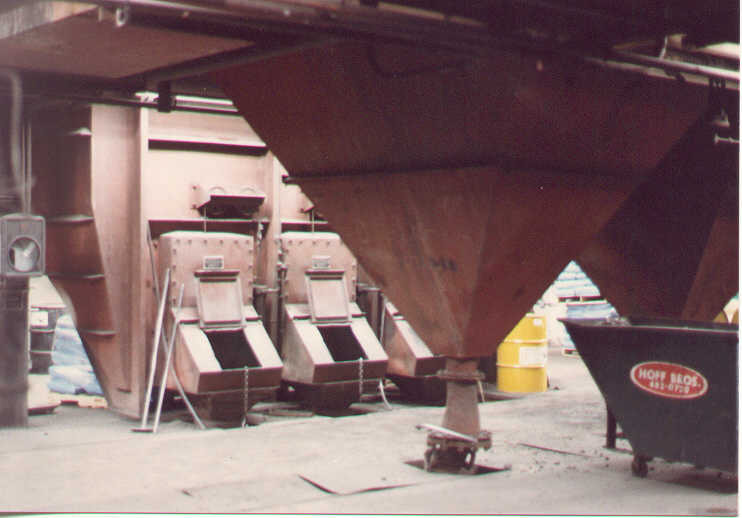 Ashes were removed from the boiler through the three doors, and sucked into special ash piping in the floor and transported to the ash silo through a vacuum system. The ash from the solo would be trucked away as necessary. Notice the required tools for 'pulling ashes' of sturdy hoe and pry bar leaning against the left hand hopper. Burner front of Boiler #5, a package unit installed during the expansion and set up for burning heavy oil. This boiler replaced a much older coal unit. 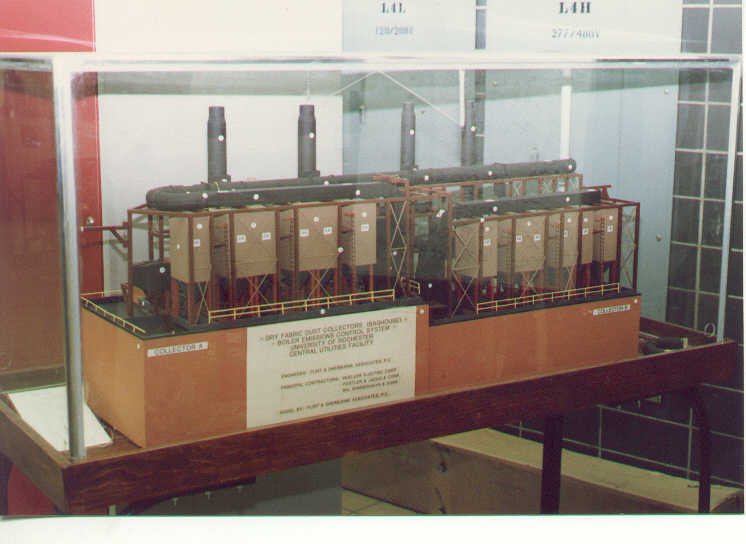 An architectural model of the Fabric Collector system as it would appear on the rooftop, this scale replica had been prepared prior to constuction. 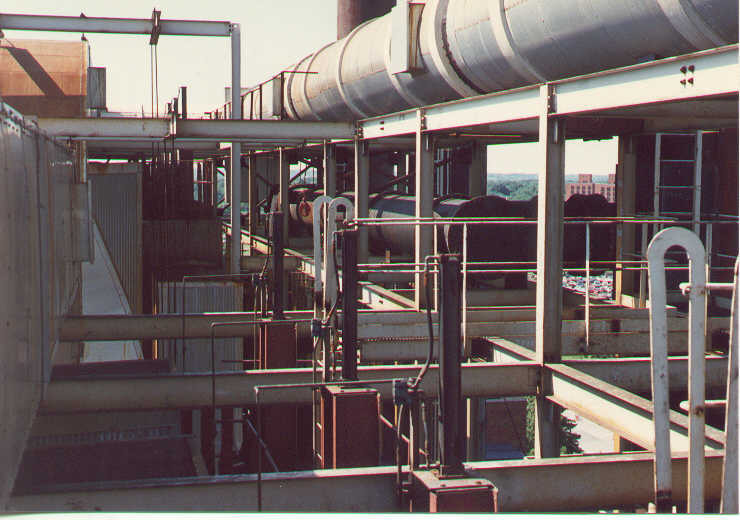 The brown colored compartments receive the flue gas from the boilers through a lower inlet manifold not visible in this view. The black ductwork running around the top of compartments is the exhaust or outlet manifold. Two large booster fans at the center of the model, which were positioned at the outlet of each baghouse, helped move the gases through the lengthy ductwork. Each baghouse contains six large filter compartments, each filled with hundreds of 'bags'. Perched atop the baghouse,looking down across the compartments at the various dampers and patchwork of steel beams holding it all together. One could see for miles in every direction, with an especially good shot of the airport. During the baghouse days, if someone had a job to do up there, they were guaranteed a nice view of the surrounding area. But all would quickly agree, it sure was a bit cold and breezy at times. What a lovely day for a view!! Standing on top of a baghouse compartment, next to the upper exhaust manifold, and just a few feet below the top of the stacks. Boiler #7 stack at the far end is giving off a slight haze. Burning coal cleanly is never a small task. The change to environment friendly natural gas negated the need for baghouses. In 1998 the rooftop structure was removed, the tall stacks were shortened, and after nearly eighty years of burning coal at Central Utilities, an era came to a close.